Are you teaching in a way that is not your strength? School in this house generally means workbooks, readers, paper and pencils. That’s MY kind of school. The smell of fresh workbooks, the excitement of a blank assignment before me with endless possibilities. However, for my very kinesthetic, hands on daughter, this type of learning is a recipe for tears and frustration. I have seen all those amazing homeschool moms with their Montessori classrooms, their trays full of activities and hands on learning. I have coveted their free spirits and their seeming nonchalant attitude towards the mess such “hands on learning” creates. I have marvelled at their creativity and their passion as they sacrifice their evenings planning their trays and activities for the next day. For me, the work, the prep and planning, the mess, and the lack of my favorite aspect…. PAPER, makes this style of teaching seem completely out of my reach. 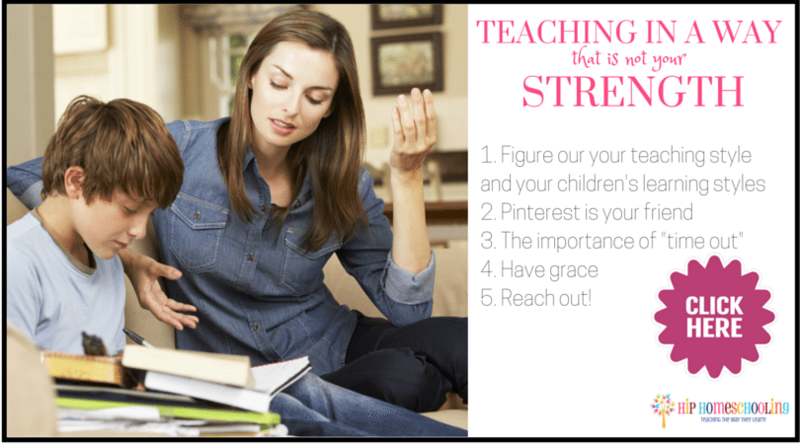 5 Tips to Help You Rock Teaching in a Way That is Not Your Strength. 1. Figure out your family’s learning styles. This is so important! If you are feeling like you are not getting through to your kids, take the learning style quiz. It takes only 5 minutes and you can take it for yourself too! Understanding YOUR learning style will help you figure out your teaching style–the two usually go hand in hand. We teach how it makes sense to us, but that doesn’t mean it will make sense to our children. If it is something that doesn’t come naturally to you, you are going to have to think outside the box! If you are a free-spirited, fly-by-the-seat-of-your-pants kinda person, yet you have a child who thrives with routine… get searching on Pinterest mama! Start looking up workboxes and scheduling helpers and planners and routines for kids! If you are a person like me who likes books and reading and checklists yet you have a child who is bouncing off the walls… you need to be searching for hands on lessons, fidget, math games and other creative solutions! There are SO many ideas out there and you are not the only one whose teaching style is clashing with their child’s learning style. It is HARD–but there are many mom’s before you who have been making it work, seek them out! If you are teaching in a way that is not your strength, I can promise you there are going to be some dips along the way. Some days it just won’t work for you, it will be frustrating and downright hard! On those days, it is so important that you just take a time out! STOP, go to the park, go for a walk, hide out in your room, pray about it! The point is to take some time away from lessons and refocus, re-evaluate. What isn’t working? Is it just an off day, or has this been going on for a while? Spend some “Hip Homeschooling prescribed” time on Pinterest or Google looking for new, innovative ideas to try! When you are teaching in a way that is not your strength, you need to have grace with both your child AND yourself! Patience is something that is learned, not naturally given to us. Those of us teaching our opposites are CONSTANTLY growing in this area of our lives, and constantly seeking MORE of this sometimes painfully distant virtue. So on the days you lose your patience, on the days your child loses their patience, take a deep breath and don’t be too hard on yourself or them. Recognize that the road may be a little bit bumpier but there are so many benefits! Both your child and you are growing and learning in new ways each day as you work together with your different learning styles! You have so much to offer each other and one day you will look back on this time as one of your most precious gifts! If you are teaching in a way that is not your strength, you need a support system. Maybe that is your family, maybe that is your co-op, or some good homeschool friends! It can even be an online Facebook group or maybe you find some encouraging bloggers on Periscope! Whatever it may look like for you, find some other parents that can help you see past your situation. People who can give you encouragement, advice, ideas, inspiration, or maybe just a listening ear and a pot of coffee! 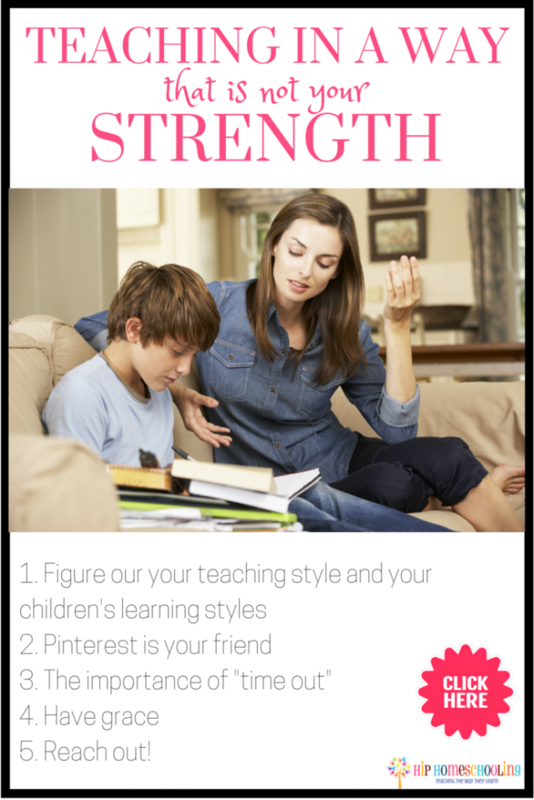 Our greatest strength as homeschoolers is that we are NOT doing this alone! There is a HUGE growing community of people just like us and if we can be real and honest with ourselves and each other, we can find a place to help us flourish in our homeschool! Are you teaching in a way that is not your strength? Comment below! Way to go Rebecca…. God Bless you with His abundance!…. You are a great mom!